This handmade jewelry box provides sturdy protection for your pieces when you’re on the go—and serves as a safer resting spot when you’re not. The square case is wrapped in quilted leather for a distinctive look. The inside is lined with LusterLoc, a treated suede that helps prevent jewelry from tarnishing, which keeps your baubles looking perfectly polished. It's beautiful, extremely well made, and passed my expectations! I'm very pleased, thank you! Gave this to my college age daughter for bringing jewelry back and forth to school, as well as for travel. She loves it! Very well designed and constructed with high quality materials. Will probably buy more for gifts. The handmade jewelry boxes from WOLF 1834 keep jewelry safe and tarnish-free, whether on your bureau or on a plane. The outside is wrapped in quilted genuine leather, which is WOLF 1834’s hallmark. They’ve been handmaking jewelry cases for five generations that are renowned for their quality and construction. Inside the cases, a soft suede lining, called Lusterloc, has been specially treated to absorb naturally occurring gases that can cause jewelry to tarnish. 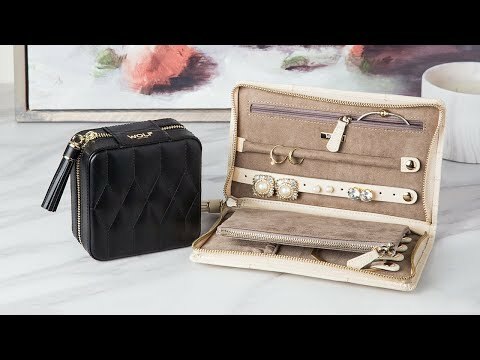 Both the sturdy, box-style case and the softer, clutch-inspired portfolio are well-organized with designated spots to keep all your baubles perfectly in place.